Our experience and network of contractors allows us to draw on a broad array of remedial technologies to achieve your goals. We are not locked into a specific technology; rather we implement individual, combined, or innovative applications based on site conditions and goals. Mechanical Mixing for the in situ and ex situ application of reagents with soil and waste. 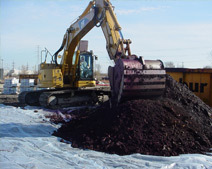 Documentation of stabilization and destruction and where appropriate, natural attenuation processes of residual contaminants. Our technology “toolbox” allows us to select the methods that best balance project-specific remediation goals, schedules, and costs. Our network of contractors skilled in the application of these technologies include service providers in the Midwest, Northeast, and Southeast regions of the United States.